← And Don’t Call Me Buttercup! I decorated the grapevine wreath. I was really into grapevine wreaths and my hot glue gun for a while there. Perhaps I should get back into it. We almost never use our dining room table, although I do have a couple of jigsaw puzzles I’d like to work on at some point. 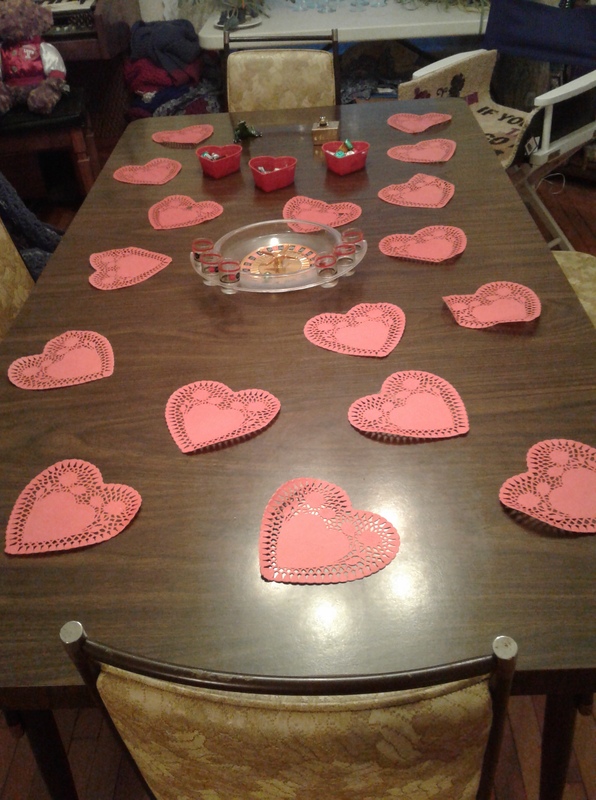 Usually Steven puts a seasonal table cloth on, but apparently the Valentine one he had got damaged. I personally like the doily look. I gave him the roulette wheel in the center for his birthday one year. I found it at a second-hand shop. The buffet is also in the dining room. Ignore the mural on the wall; that was there when we moved in. 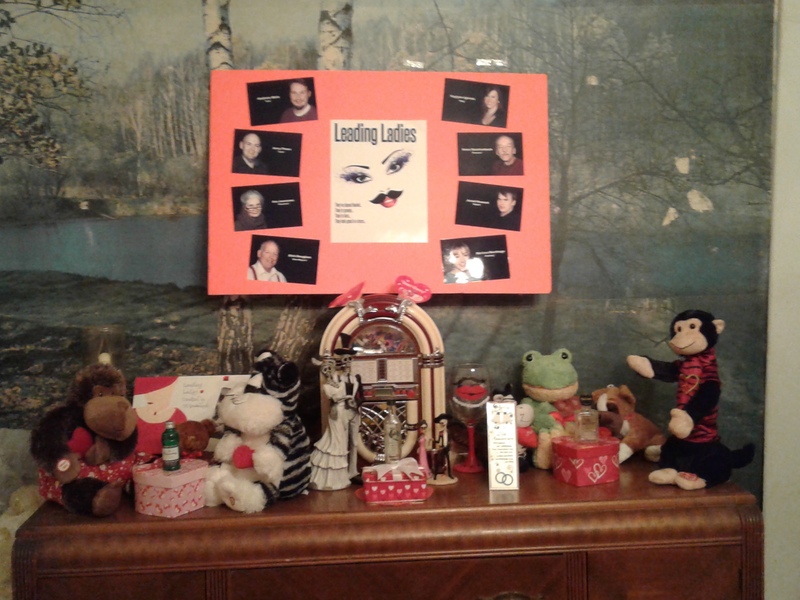 The poster partially blocking it was displayed in the lobby of Ilion Little Theatre during the run of Leading Ladies, the show I directed last spring. The juke box is out all year. It is one of Steven’s prized possessions. 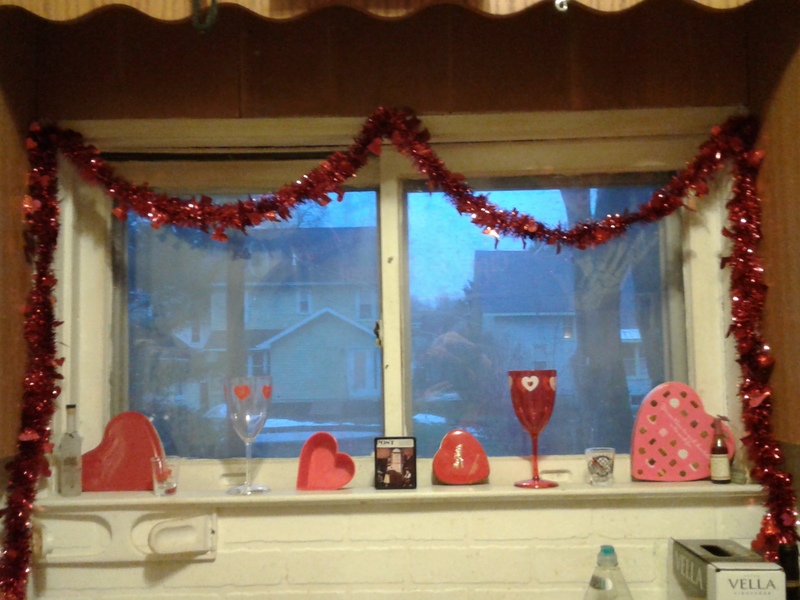 This is the window over our kitchen sink, looking out into our backyard. I carefully held the Tablet so as not to photograph the dirty dishes in the sink. Um, I mean, there are no dirty dishes in my sink. Now I must start thinking about Valentine’s Day. What, oh what, can I give my beloved husband? 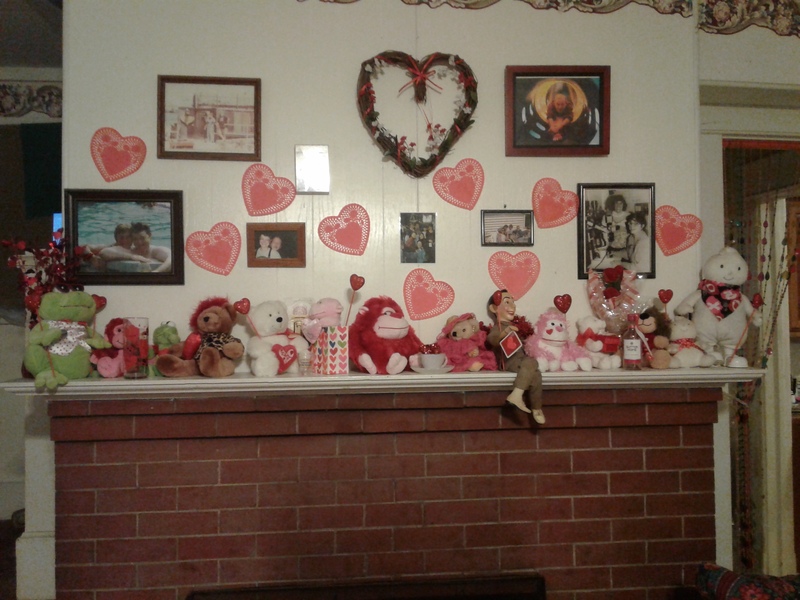 As you can see, we already have a lot of cutesy little stuffed toys, heart shaped boxes and other Valentine memorabilia. I’ll try to think of something good. Then I’ll write a blog post about it. In the meantime, Happy Friday, everyone! Posted in humor, personal and tagged blog post, decorations, husband, Lame Post Friday, photos, Steven, Valentine's Day. Bookmark the permalink.